Lake real estate is a non-traditional niche that varies greatly from your run-of-the-mill residential or commercial markets. Many lake homes serve as secondary, or vacation, homes. This factor, combined with their coveted locations, often place these listings at a higher price point. Lake homes can range from ordinary to downright opulent. We’ve found some of the most luxurious, eye-catching homes for sale on Lake Michigan because honestly, who doesn’t love gushing over waterfront estates? This property is full of charm. It features a fitness room overlooking the lake, open floor plans and a custom-designed home theater. Thanks to the abundance of large, wide windows, natural light floods almost every room and allows for some of the best sunset views year-round. This contemporary lakefront masterpiece sits on 5.3 acres of lush woods and gardens. 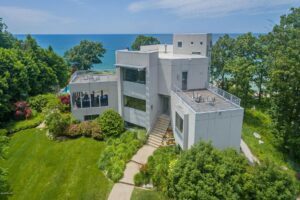 Sleek and stylish, this modern home features impeccable architecture and vast, stunning views of Lake Michigan. Elegance is this lake home’s main characteristic. In addition to direct access to the freshwater beach below, this property boasts immaculate details like limestone and bronze-clad windows and doors, sophisticated woodwork and coffered ceilings, giving it a truly timeless appeal. This stunning estate offers the best of classic beachfront living. An infinity pool, private beach access, sweeping views and a full wine cellar: what more could you ask for? A full home theater? Because it has that too. 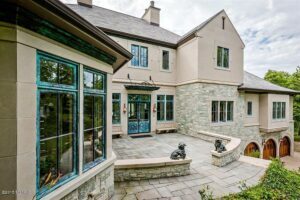 In this beautifully remodeled home, all eight bedrooms have access to gorgeous views of Lake Michigan. First class amenities include radiant hardwood floors, granite and marble countertops throughout and a jaw-dropping indoor pool with a waterfall, sauna and spa. This majestic waterfront estate has it all!